Claudia Bedolla spent years as a stay-at-home mom. Last month, though, she started looking for domestic work through a new women’s day labor program in Pomona. She had a few reasons. She’s referring to a California law, known as AB 60, which went into effect in January. It allows immigrants without legal status to apply for special driver’s licenses. “We’ve had AB 60 since the beginning of the year, and now folks are starting to get those licenses, and I think that has created more mobility, especially for these women that were previously stuck at home or on public transit,” said Benjamin Wood, an organizer with The Pomona Economic Opportunity Center, which is helping Bedolla. The facility opened last month. It’s latest day labor center to include a program for women. Just a handful of women’s day labor programs exist in Southern California, typically attracting women who are seeking domestic work, like house-cleaning jobs. Many are immigrants from Latin America. About 15 women have signed up in Pomona. Wood says he met several of them while conducting workshops on AB 60. “I realized they were some of the same folks that were working to get their license, that were also in need of work,” Wood said. But domestic jobs can be hard to get to on public transit. For years, women have had to rely on rides or public transportation, walking the rest of the way into residential neighborhoods. AB 60 kicked in at the beginning of the year. According to the California Department of Motor Vehicles, nearly 400,000 AB 60 driver’s licenses were issued in the first half of 2015. 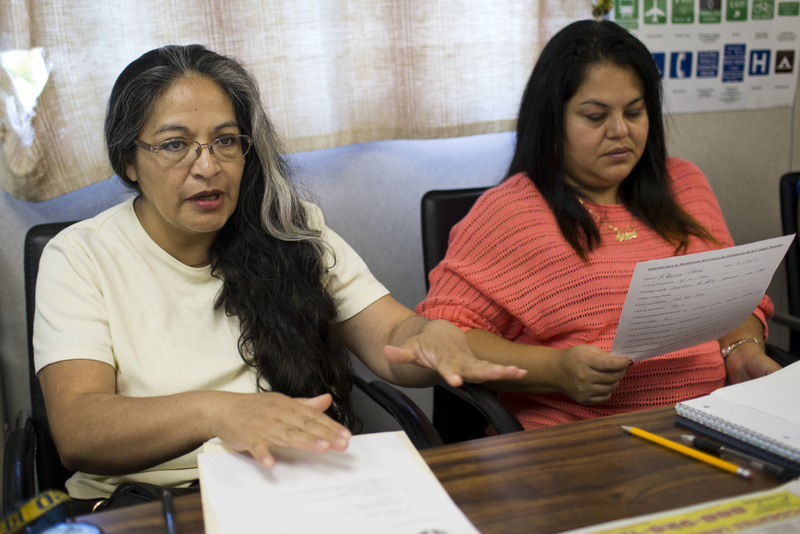 On Tuesday morning in Pomona, about half a dozen women gathered around a conference table with labor center staff, going over jobs available, wages, and what skills they’d like to learn. Some, like Bedolla, were new to domestic work; others had done it before. Adriana Chavira said she’s worked as part of a cleaning team, in part because she doesn’t drive. It has brought in a little income. But she’s looking forward to earning more once she’s driving; she’s studying for her driver’s license test.